Hey everybody! 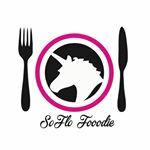 We’ve been a little busy here @soflofooodie with the end of the school year (special needs teachers here), and moving into the new house but DO WE HAVE NEWS FOR YOU! but first…. a little background on the topic. So for those of you that don’t know (which is probably a HUGE chunk of you) Steph used to own her own cake/cupcake business. Yep, that’s right…she spent COUNTLESS hours baking, and perfecting each and every cake/cupcake she made. She owned this business with one of her long time friends however, after a few years of doing it….their lives got in the way and they decided to quit. Steph took her talents into helping me with @soflofooodie so we made it a double team kinda thing. Recently, a client of ours asked us to make a test run of her cupcakes so he could sell them at his shop. At first, we didn’t really know what to expect. She really only sold her items to previous clients, never at a store front. We came up with four flavors… Oreo stuffed, Nutella stuffed, Strawberry cheesecake stuffed, and Funfetti filled with sprinkles (think piñata)! We are so glad we chose to do it because that weekend of the trial, the cupcakes sold out completely! So, somewhere in the middle of all the busy days we’ve been having, a little miracle has been baking ;).